While everyone was distracted by the Democratic Convention last week, 64 Republican congressmen’s request that the IRS investigate the Clinton Foundation was granted. The IRS, a non-partisan government organization tasked with collecting taxes from U.S. citizens, has a special office for exempt operations like the Clinton Foundation, a non-governmental organization (NGO) who touts itself as the premier charity to the world. IRS Commissioner John Koskinen had referred congressional charges of corruption by 64 House Republicans on Tuesday, July 26th during the Democratic National Convention, which was too busy dealing with Bernie-or-Bust protesters and the Wikileaks dump of DNC emails the weekend prior to the convention. 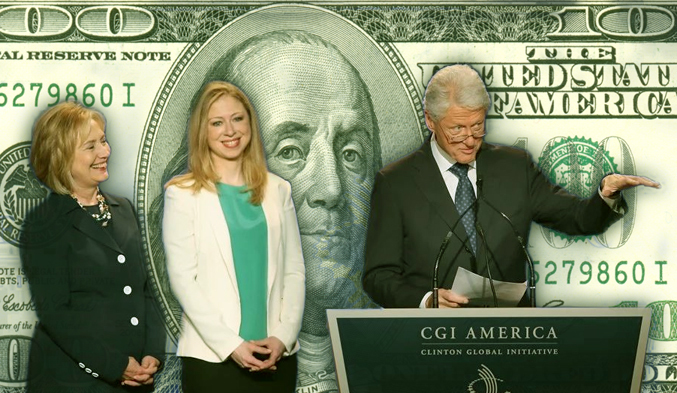 Clinton Foundation “pay-to-play” activities, a form of indirect bribery, seem to be the ultimate charge. The request to investigate the Clinton Foundation on charges of “public corruption” was originally made in a letter to the FBI, FTC and IRS on July 15th this year, but only the IRS picked up the investigation. This could prove particularly difficult for the Clinton campaign for presidency after already dealing with an FBI investigation regarding Hillary’s email server for which she illegitimately used to handle classified information. The initiative is being driven by Tennessee Representative Marsha Blackburn (R) who serves as vice chairwoman of the House Committee on Energy and Commerce, which happens to oversee the Federal Trade Commission. The FTC also happens to regulate public charities with the help of the IRS. The IRS investigation could be the first step in getting to the truth about whether or not the Clinton Foundation is as corrupt as Hillary’s opponents have been asserting for years. However, as Western Journalism has pointed out, the letter gives a solid starting point for investigation, beginning with Laureate International Universities, who paid former President Bill Clinton an estimated $16.5 million dollars over a five-year term to be Laureate’s “honorary chancellor” while USAID gave over $55 million in grants to the International Youth Foundation, a separate entity run by Laureate’s chairman, Douglas Becker, during the years od 2010 – 2012, while Hillary was Secretary of State (2008 – 2012). Bill Clinton recently resigned from his position at Laureate International Universities. What may be even more damning of the Clinton’s crony capitalism at work is the Clinton Foundation’s connection to a Russian uranium company named Uranium One, the letter says. Uranium One donated several amounts of money adding up to around $23 million, according to an article by the New York Times’ Jo Becker and Mike McIntire, yet the Clinton Foundation never reported the donations. Most recently, the Justice Department had indicted congresswoman Corrine Brown (D) of Florida for using over $800,000 in donations as a “personal slush fund”. Brown is also a super delegate who supports Hillary Clinton in Clinton’s bid for presidency and has been a member of the Hillary Clinton Leadership Council of Florida for some time now, and the House Republicans involved in this letter are using Brown as an example of someone who was rightfully indicted for misuse of charitable funds (it also doesn’t help that she had close ties to Hillary Clinton). In a parallel, but perhaps more largely scaled comparison, the Clinton Foundation received a reported $337 million in 2014 alone, most of which was received by foreign donors while weapons deals from the State department took place under Hillary Clinton.